She was born September 20th, 1977 in Okinawa, Japan. Her blood type is 'O', she is approximately 5'1" tall, approximately 100 lbs. and her measurements are 30-23-33. 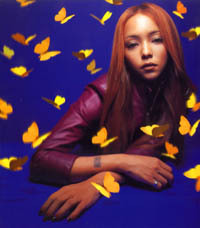 Settled at the age of 22, married with one child, Amuro had taken time off in 1998 before proceeding to make her latest albums, one of which is the topic at hand : "Genius 2000". Not only a major pop star, but a trendsetter as well, Amuro has had a most successful career with the help of music mastermind, Tetsuya Komuro. As with many other TK works, I obtained this album from my good friend Troy "Yen" Gonzalez, recording engineer at True Kiss Disc, Honolulu. He participated in the recording of tracks 6, 9, 10 & 13. Boy, and I thought I was repetitious! ^^; TK inserts first and last track scenarios for this album, those of which sound like connecting to the Internet. Nice touch, really. An awesome way to kick off a pre-millennium album! This song is a bit of dance and rock at the same time, with the occasional voice mixing. I have not heard Amuro's other album-works except for "Concentration 20", however I can confidently say that this song ranks in the top 10. This was the first music video I had seen of Amuro, and the song reminds me a bit of how American R&B used to be in the early 90's. Amuro really puts a lot of 'soul' into her singing. 'This has a more modern theme of American R&B to it, rather the 1998 year of style. The classic beats and sounds that anyone could enjoy 'bumping' to... LoL. Nevertheless, this song deals with risking and riches, with the classic phrase, "Gotta get some money". One of my more favorable tracks on the album. Obviously a hurt-ballad-beat song, this song follows the theme of basic heart-break songs. This is where the style of Amuro is really revealed, in that which she mixes Japanese singing with English singing in the background. A translation factor, if you will. The way Amuro sounds here almost reminds me of Tomomi Kahala (Solo J-Pop artist) - - The way she 'waves' her voice is almost like the texture at which Kahala does. Another of my favorable tracks because of the way it flows -- Not too rough, not too mellow. This is a cute song, with nice beats as well. It reminds me of another early-mid 90's American song... but of course, the name escapes me. It just goes to show how much American music has even influenced Japanese. A most favorable track to many who have heard this album. What I suspect is that the flavor of the Spanish Guitar and somewhat dance-salsa splash is different than the other tracks on this album, thus making it 'stand out'. The lyrics and English input is great too. I just recently saw the group 'IMAJIN' on a Japanese Soap Opera called "LIVE" (starring ex-SPEED member Eriko Imai). These guys really do a great job with Amuro, as they mentioned in the soap opera! This song is a R&B, as most of Amuro's songs are, but more soulful. I love this track. Its so deep and smooth sounding, however, I can't escape the fact it sounds like a make-out song ^^;;; Ah well! Good is good, neh? You can assume what the song relates to in which were Amuro says, "karui kiss, daisuki na anata no". Another great song... yet, another make-out theme! Ahh gee. What's been on my mind lately! Just kidding of course! Amuro's voice seems more lustrous here compared to the other tracks, proving one heck of a song. Another ballad. You could say this album goes through a series of themes because of the more R&B hyped songs, then to the slower R&B ballads. I also love the fact that Amuro speaks so much English in her songs, which I know is pretty common these days in Japanese music. I just get a kick when she says "Boy, stop feeling sorry for yourself". With each log-on, there is a log-off. This short piece features TK's masterful piano playing once more as a bid of farewell to listeners of Genius 2000. The slip case (as seen in the upper-right corner of your screen) is the beautiful cover of Genius 2000, featuring Amuro posing with an almost Mona Lisa-like smile. It is beautifully decorated with yellow butterflies (digitally enhanced, of course ^^;) surrounding Amuro, implicating the color scheme of the album, which is blue and yellow. The album cover itself simply features the track titles (in yellow) before a blue background, and the pamphlet features nice images of Amuro in a dressy suit. With that said, Amuro's rest paid off, thus producing a beautiful album to enjoy until her next release. You never know when her next move will occur, so keep an eye out! Want to hear a sample of Namie Amuro - Genius 2000? Tetsuya Komuro & Dallas Austin for DARP, Inc.
Comes with a Slip Case Cover Box.